Please see below for information from the Town of Hilton Head regarding their upcoming emergency beach fill project in Sea Pines. CSA will continue to pass information related to this project as it is provided to us by the Town of Hilton Head. The Town hereby announces the intention of our contractor, Marinex Construction to commence with mobilization activities associated with the above referenced project on August 15, 2017. Stakeholder interests should expect to see significant marine based activity in the area. Marinex is planning for a water based mobilization with equipment and pipeline both being barged in. A barge landing is expected to occur at South Beach. The contractor expects to place his submerged pipeline landing in the vicinity of Beach Marker 19 (near Green Winged Teal Street) starting on August 15. The submerged pipeline between the beach landing and the Barrett Shoal borrow site will be installed prior to the dredge coming on station. Once all pipeline and the dredge is in place, beach work will be accomplished in 2 segments. 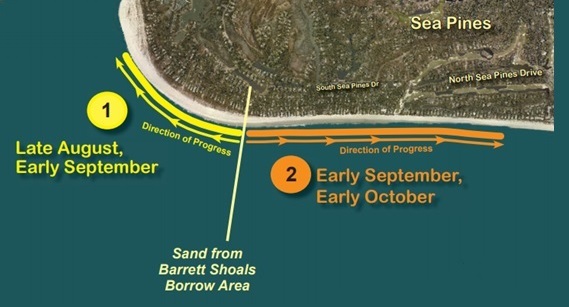 The first occurring from the submerged pipeline landing to the southern terminus of the project near Beach Marker 12 (Brown Pelican Street) and the second segment from the submerged pipeline landing to Beach Marker 34 (East Beach Lagoon Drive). Segment 1 work is expected to occur in late August/early September followed by Segment 2 work which is expected to occur between early September and early October. Marine interests should be mindful of the US Coast Guard issued Notice to Mariners regarding work impacts to the navigable waterways. Click here to sign up for South Island Emergency Beach Renourishment Project e-subscription service from the Town of Hilton Head to receive project updates and daily restricted area location reports via email and/or text message notifications. (Enter your email address or phone number to view the listing of subscription categories).